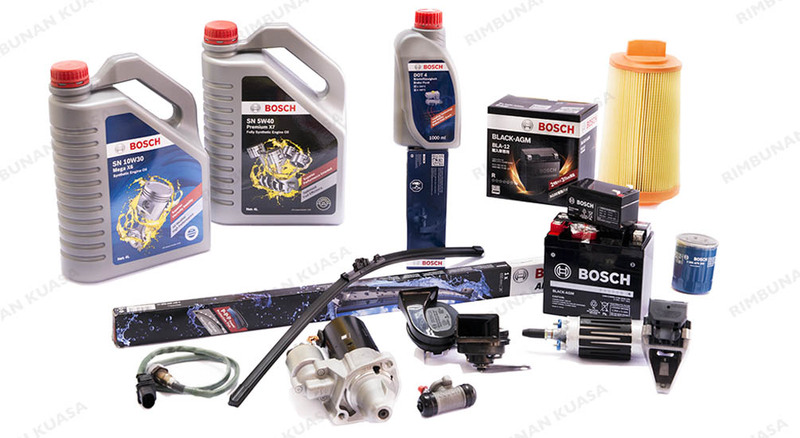 Rimbunan Kuasa Sdn Bhd is one of the top authorised dealers for BOSCH spare parts in Malaysia. What this means is you can have a greater piece of mind when dealing with us by choosing genuine BOSCH spare parts for your vehicle. International supplier of technology and services, the Bosch Group delivers innovations that are “invented for life”. In the automotive aftermarket industry, Bosch works closely with vehicle manufactures to produce and supply top quality, reliable and innovative Bosch spare parts in Malaysia. With over 132 years of expertise, Bosch’s success is proven as they have garnered numerous awards and recognition within the industry, such as the “Best Brand 2017” title for 6 automotive categories, and the number one ranking for Fortune’s World’s Most Admired Companies 2017 for the third consecutive year. Like most brands within the automotive aftermarket industry, BOSCH spare parts in Malaysia are subjected to rigorous testing to ensure its safety on the road. However, with more and more counterfeit products available in the market today, it is difficult to differentiate between authentic and fake spare parts. Counterfeit products generally have lower vehicle performance, and when used on the road, it can endanger the lives of many. Our partnership with BOSCH allows us to offer you with high quality spare parts and accessories, such as, brake oils, engine oils, air filters, oil filters, wipers, and many others. Rest assured that you are getting optimum performance and high standards of safety for your vehicle.